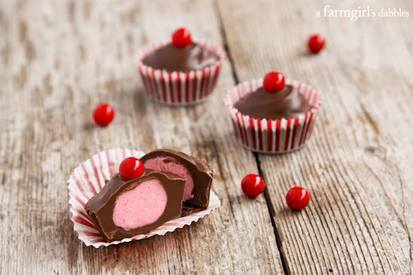 I had so much fun creating these Chocolate Cherry Candy Cups! At the center of each of these candy cups is a creamy pink mixture, sweet with the flavor of cherry. Melting chocolate, rolling little pink balls in the palms of my hands, chasing runaway Sixlets on the countertop…it was a fun afternoon in the kitchen!